WASHINGTON, DC, December 20, 2011 (ENS) – Health and environmental risks must addressed when considering whether to lift the 30-year moratorium on uranium mining in Virginia, finds a new report from the National Research Council, the operating arm of the National Academy of Sciences and National Academy of Engineering. If Virginia lifts its moratorium, there are “steep hurdles to be surmounted” before mining and processing could take place within a regulatory setting that protects workers, the public, and the environment, especially given that the state has no experience regulating mining and processing of the radioactive element, concluded the committee that wrote the report. “Internationally accepted best practices, which include timely and meaningful public participation, are available to mitigate some of the risks involved. However, there are still many unknowns,” said Paul Locke, chair of the committee that wrote the report and associate professor, Johns Hopkins Bloomberg School of Public Health. Dr. Locke presented the study findings to the Uranium Mining Subcommittee of the Virginia Coal and Energy Commission. The study was requested by the Commonwealth of Virginia after owners of a large uranium deposit at Coles Hill in southern Virginia began to call for an end to the moratorium. Spread beneath 200 acres and reaching depths of more than 1,500 feet, the Coles Hill ore deposit is the largest undeveloped uranium deposit in the United States and the seventh largest in the world, says Virginia Uranium Inc., the company asking that the ban be lifted. Containing approximately 119 million pounds of uranium oxide, the deposit is estimated to be worth more than $7 billion. The committee was asked to assess the physical and social context in which uranium mining and processing might occur; national and global uranium markets; technical options and best practices for uranium mining, processing, and reclamation; and potential impacts on public health, worker safety, and the environment. It was also requested to review the state and federal regulatory framework for uranium mining, milling, processing, and reclamation. The study questions were provided by the Commonwealth of Virginia. The study was funded under a contract between the National Research Council and the Virginia Polytechnic Institute and State University. Funding was provided to the university by Virginia Uranium Inc.
“Virginia Uranium believes this study provides a clear road map and path forward for operating the world’s safest uranium mine in Virginia,” said the company’s project manager, Patrick Wales. The committee was not asked to recommend whether uranium mining should be permitted, nor to consider the potential benefits to the state if uranium mining were to be pursued. It was not asked to compare the relative risks of uranium mining to the mining of other fuels such as coal. Should the ban be lifted, uranium mining and processing are unlikely to begin for at least five to eight years after the initial granting of a license, the report says. This time should be used to build a robust regulatory and management culture focused on safety and citizen involvement. The experience of Canada and Colorado, which have both enacted laws and promulgated regulations in recent years that are based on modern practices, may be helpful to Virginia, the committee advised. The report identifies a list of best practices that should be required in a regulatory program if Virginia decides to allow uranium mining in the state. These recommendations rely on the track record of uranium mining operations in Canada and Colorado. Although the committee was not asked to assess the suitability of the Coles Hill site, it said the Coles Hill uranium deposit is large enough and of a high enough grade to be economically viable. Uranium mining in Virginia could potentially impact water, soil, and air quality. The degree of impact would depend on site-specific conditions, how early a contaminant release is detected by monitoring systems, and the effectiveness of mitigation steps. The solid waste left after the uranium ore is processed, called tailings, also could contaminate the environment. The study recommends that Virginia’s regulatory program adopt the ALARA standard – as low as reasonably achievable – for impacts on public health and the environment, a recommendation that pleased the company, said Wales. 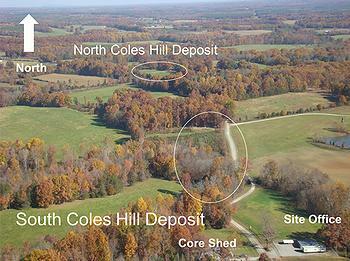 Since 1785, the Coles family has lived continuously on the Coles Hill farm in Pittsylvania County where the uranium deposit was discovered in 1978. Virginia Uranium’s president, Walter Coles Sr., now resides at Coles Hill with his wife, Alice. Though they no longer raise tobacco, the long-time mainstay of Coles Hill, they raise some 300 head of cattle. The Coles family plans to live on the farm during the development of the deposit and for generations after its reclamation. The United States produces three percent of the world’s uranium supply, most of which comes from eight countries. Last year the United States imported 92 percent of the uranium that it needed to fuel the country’s 104 nuclear reactors.